Home | Productions | Concerts | On Air, Again! A big thank you to all those who came to see us in "On Air, Again!" this week, and of course to all those who worked so hard to make it happen! Backstage at "On Air, Again!" Backstage at "On Air, Again!" - an impressive set of equipment that is used to control the big screen that the audience sees out front, turning the Armstrong Hall into Thornbury's very own 'television studio' for the week! Intrigued? Come on down to the Armstrong Hall at 2:30 and 7:30 today to enjoy the show and find out more! (tickets also available on the door). Read more about Backstage at "On Air, Again!" Who remembers this old TV test card or when TV stopped at 10pm? Come and relive all the great TV moments from across the years at our production of "On Air, Again!" There's everything from Morecambe and Wise to Top of the Pops to Andy Pandy, and much much more. Having the same problem as Margaret and can't find anything to watch on the telly? 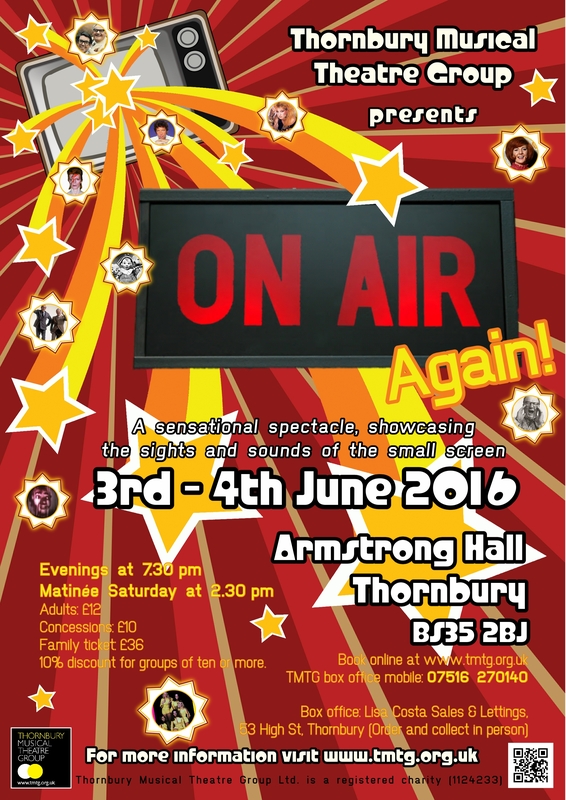 TMTG are here to help, with our summer concert "On Air, Again!" at the Armstrong Hall THIS WEEK! Join us 3rd-4th June for an evening (or afternoon!) of entertainment from Thornbury's very own "television studio", featuring all sorts of songs and sketches from TV across the ages. Read more about Nothing on Telly? Make sure you tune into Bradley Stoke Radio today, members David, Lizzie and Philip will be live on the 1-3pm show talking about our upcoming concert "On Air, Again!". While you're at it, get your tickets - just one week to go! Seeing as our upcoming concert "On Air, Again!" is based around the history of music on television, TMTG members took a trip to BBC Bristol today for a behind the scenes tour. Here we are in the BBC Points West studio...pretty sure we'll be asked back to present the news any day now! Have you spotted our "On Air, Again!" publicity out in Thornbury today? Banners and roadside boards are up and our members have been busy handing out flyers in Tesco. This can only mean one thing...show week is getting close! Rehearsals are in full swing for our summer concert "On Air, Again!" and there's not long to go until show time now! We're performing at the Armstrong Hall from 3rd-4th June - tickets are available either at www.tmtg.co.uk/tickets or from Lisa Costa Residential Sales & Lettings, 53 High Street, Thornbury. Have you spotted our 'On Air, Again!' advert in Thornbury Magazine this month? Just a month to go now (performances 3rd & 4th June), get your tickets now. The weather is getting much warmer, which must mean summer is just around the corner (we hope!). So it's time to get the date in your diary for our summer concert "On Air, Again! ", which is running 3rd-4th June. There are just three performances so make sure you get your tickets before they go! Rehearsals are well under way for our summer concert "On Air, Again!" and it's just over two months until the show! Read more about NODA Nomination - Imaginative Compilation Show - On Air, Again!